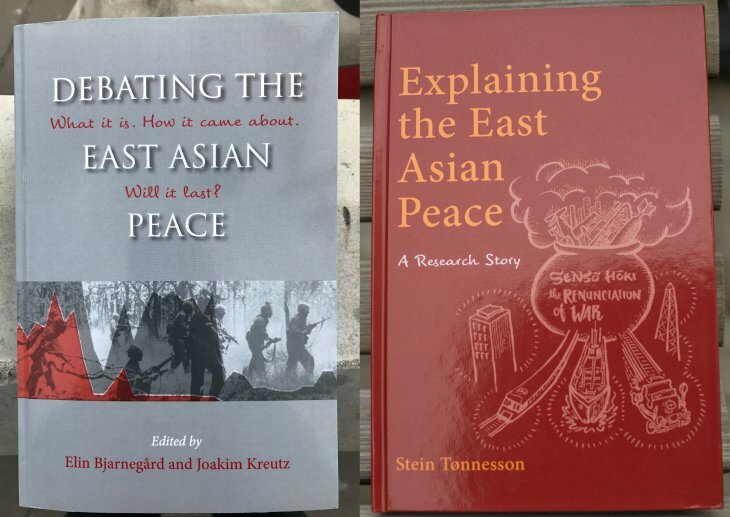 Two books were launched earlier this week from the East Asian Peace (EAP) program at Uppsala University, led by Stein Tønnesson of PRIO and Uppsala University. One is a monograph by the program director, Stein Tønnesson, Explaining the East Asian Peace, the other a volume edited by Elin Bjarnegård & Joakim Kreutz, Debating the East Asian Peace. The EAP is a very impressive program. The two books take on a key issue in the debate about the decline of war, the disproportionate reduction in conflict in East Asia. They provide a large range of different explanations for the East Asian Peace. They combine statistical analysis with illuminating case studies of individual countries and their bilateral and regional relations. And they are very up to date. 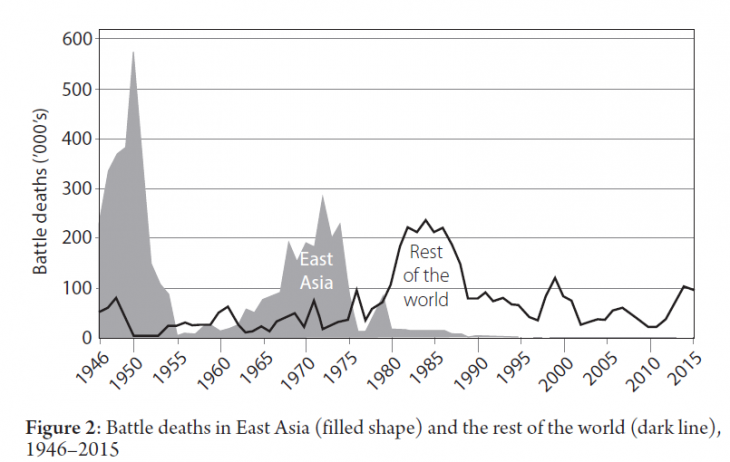 This figure shows convincingly that a large share of the decline of war in the period after World War II is the decline of battle deaths in East Asia. However, if we extend the historical perspective back to WW II, we see much higher absolute numbers, peaking at about seven times the peak in 1950. Many of these deaths also occurred in East Asia, but even more occurred in Europe. This map shows the concentration of battle deaths in East Asia. The size of the circles is proportional to the number of battle deaths. This picture is mainly driven by the Chinese Civil War, and maps for the 1950s and the 1960s show similar patterns because of the Korean War, the First Indochina War and later the Vietnam War. In the 1940s, but not in the subsequent decades, we also see clearly the Greek Civil War. Here we see a clear decline in the absolute number of battle deaths, but also a concentration of armed conflict in the Middle East and in Muslim countries in the proximity of the Middle East. Large Muslim countries further away from the Middle East, like Bangladesh, India, and Indonesia, are not affected by armed conflict to the same extent. In the edited volume, Isak Svensson explores this dimension and argues that the relative absence of religiously based armed conflict in East Asia is an important part of the explanation for the East Asian Peace. However, I would be cautious about adopting a perspective of East Asia becoming more peaceful and the rest of the world standing still. Instead, I think we see a more general decline of violence in state-based conflict, but it starts at different times in different regions. Europe was first, then East Asia, then Latin America, and then Africa. The main remaining battlefield is the Middle East and Muslim countries close to it. This is of course very serious for people who live in this region and there is some spillover in the form of terrorism in other regions, including Europe. Even in the Middle East, the lethality of conflict peaked in 2014 and has leveled off in the last two years. The prospect of a future decline of war even in this region is tenuous, but is in any case outside the framework for this seminar. However, despite the horrors of the war in Syria, they do not match the lethality of the War between Iran and Iraq in the 1980s. Finally, none of this takes account of the large increase in population over this period. The probability of a random individual getting killed in battle-related violence in a given year was about 1: 600 in World War II, about 1: 5 000 in 1950, and about 1: 70 000 in 2014, the worst recent year. So, the safety of a random individual, the probability of NOT getting killed in battle, has increased enormously. This perspective is not discussed much in these books. This graph also takes account of the number of people killed in what the Uppsala Conflict Data Program calls ‘non-state conflict’, i.e. communal conflicts and other conflicts where the government is not a main actor, and ‘one-sided violence’, i.e. genocide and political killing of unorganized civilians, mainly by governments. The list of cases of one-sided violence includes the Holocaust, violent persecution of the losers after a war has ended, and massacres of political opponents. Unfortunately, this graph suffers from the relatively short time-span of the UCDP data on the other two forms of violence. Even so, we see an overall decline from the mid-1990s, if we take into account that the genocide in Rwanda in 1994 with an estimated half million deaths has been permitted to go through the ceiling of the graph. East Asia is low during the entire period. But if the data had covered a wider time-span and included violent events during the Maoist regime in China, notably the Great Leap Forward in 1958-61 and the Cultural Revolution later in the 1960s, the decline over time would have come out much more clearly and even Rwanda would not stand out so dramatically. The comparison with the Rest of the world suffers from the same problem that I’ve already discussed. 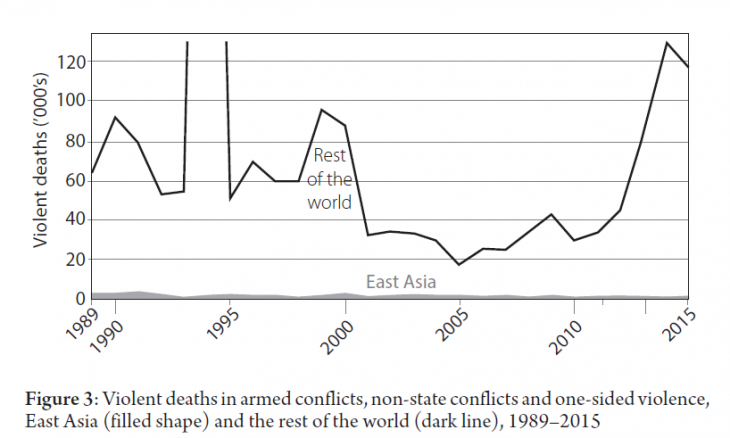 The recent upsurge in the overall number of conflict deaths is largely driven by the Middle East. First, it is difficult to assess the relative importance of the different factors. Some of the authors argue against factors presented in other chapters, but there is no real attempt to present a unified theory of the East Asian Peace. The closest candidate is Stein Tønnesson’s theory of peace by development. Briefly summarized: Japan’s decision-making elite decided in the aftermath of World War II to accept defeat and go for development. Subsequently, other states and notably China after the death of Mao and under the leadership of Deng Xiaoping, have copied this policy. It might be possible to develop a more comprehensive model where economic development influences trade, reduces fertility and eventually youth bulges, promotes cultural modernization and reduces the influence of religion, and promotes the emancipation of women – all of which in turn serve to reduce the use of armed violence. I realize that I am extrapolating wildly from Stein’s theory here. But I think this is where research on this topic needs to go, and I actually find much of the argument plausible. However, this is not the approach of this research program. Instead, the various explanations are to a large extent left standing next to each other with limited attempts at comparison and crossbreeding. The final chapter of the edited volume ends rather meekly in a wish for further study of the subject ‘by peace researchers from different backgrounds … and with different conceptualizations of peace’. Stein’s book ends in a list of ten peace proposals from ‘green growth’ to ‘promote peaceful values’. All of them seen sensible enough, but there is little sense of priorities, and it is not clear what forces will drive national decision-makers to make these political choices. Second, Stein’s emphasis on agency leaves me wondering why the decision-makers decided this way? And why then, and not at some other time? The answer might be that Japan’s defeat in war decided the timing and, thirty years later in China, the death of Mao. But why did the death of Kim-Il Sung in 1994 not lead to a reorientation in North Korea. And as to the substance of the decisions made by these agents: Did Mao not put economic development first? Isn’t this what he did (or thought he was doing) in launching the Great Leap Forward in 1958 with collectivization of agriculture and forced industrialization? Indeed, a decision for development is not a recipe for success. Those who chose to be inspired by the Soviet model of development, such as North Korea and China before Deng Xiaoping, were generally unsuccessful. Countries that chose market reform were more successful. Stein contrasts his developmental model with theories of the capitalist peace. But to me it seems that the decision to prioritize development is really a decision to go for market reform. Third, even though I largely agree with the decision to focus on the decline of battle deaths as the phenomenon to be explained, I also have considerable sympathy for Steven Pinker’s argument that there is a long-term, even if erratic, global trend away from all kinds of violence, which he explains by a common set of factors. This is indeed the approach that I have adopted in my own book on the decline of violence published last year. The Bjarnegård/Kreutz edited volume shifts somewhat uneasily between the narrow conception of peace and a broader one. Stein, like Goertz, Diehl & Balas in their recent book The Puzzle of Peace, points to the paradoxical nature of calling the present relationship between the two Koreas ‘peaceful’ simply because very few have been killed since the end of the Korean War. Many of the chapters in the edited volume deplore the repressive nature of East Asian regimes, the honor culture and male dominance, the inequality, the lack of reconciliation between previously warring countries. In some places it is not clear whether this is a normative argument demanding that peace should be more than non-war, or an empirical argument that peace in the narrow sense will be broken unless it is extended to these other fields. And how many of these broader features of peace should we take account of? Researchers in the host institution of the program in Uppsala have argued for a wider version of the concept of peace, a ‘quality peace’ somewhat similar to a broad conception of ‘human security’. Stein is skeptical. However, this broader conception underlies many of the chapters in the edited volume and is the basis of much of its pessimism about the viability of the East Asian Peace. At the same time, many of the chapters emphasize that several broader aspects of peace are improving. Physical integrity rights are being strengthened in the region. Gender inequalities are being reduced. Several countries have become democracies. It is hard to interpret these changes as the result of decisions by developmental decision-makers, but perhaps they can be understood as by-products of the absence of war. In any case, as Stein points out, the absence of war between the two Koreas for a period of nearly 54 years is in itself no trivial achievement. Fourth, instead of trying to present an integrated story of the East Asian Peace, Stein’s own monograph is to a large extent a story of the development of a research program and his own agreements and disagreements with his many collaborators. There is a place for descriptions of the research process, which often departs considerably from what you read in methodology textbooks. However, I fear that this may sidetrack the reader from the main puzzle that the project attempted to explain. Finally, a smaller complaint: These two books are published by NIAS Press. While this is a reputable publisher and the books will probably come to the attention of a wide community of scholars interested in Asia, I wonder if they couldn’t have reached a wider global audience if they had been published by a leading commercial or university publisher, even if that would have involved a longer publication lag. But, to end where I started: The East Asian Peace program is an impressive achievement, and these two books deserve to be widely read. This text is a slightly expanded version of my comments made at the Book Launch at PRIO, 9 May 2017. I am grateful for the invitation to comment on the books and for comments from Stein Tønnesson. For further information on the EAP program, see the blog post by Stein Tønnesson and the program website. Thanks to Karim Bahgat for creating the two maps. Book Notes on the two books are available here and here.